I used to enjoy having manicures pre-Liv, when I actually had the time to spend being pampered and somewhere nice to go afterwards. For the past few years being pampered has certainly not been a priority though that has all changed this year! With a beautician friend only living across the road from me there really now is no excuse not to have some me time and a gossip! Even as a teenager I was never keen on having daring colours on my nails (although I am pretty sure there some pictures of me with half blue half green nails somewhere!) and I have always opted for subtle tones of lilac, pink or just normal french tips. NEVER acrylics, they once ruined my nails and as I have good, strong nails that grow to a nice length, I do not see the need to hide them away. This year has seen me experimenting with colours ranging from very dark purple to hot chilli pink and I have loved every colour I have worn. Sticking with my usual manicure and brand I did not even realise my friend offered SpaRitual manicures. If I had known I would have certainly worn their colours sooner. Given the opportunity to test two of the latest colours in the summer range “Evolve” I jumped at the chance to review a brand I had never used and to wear new colours. The Evolve range is inspired by the elemental beauty of nature which blossoms, transitions, weathers and shifts over time. The shades are enthused by cool neutrals that represent the interwoven harmony of earth’s simple treasures. The cream touch of pink sand, the colour of driftwood bleaced by the sea water, new born ferns blossoming on earth’s floor, the marbled hues of ancient stone, and sophistciated grey of pebble all feel timeless yet modern, capturing a new ideal of beauty. From the two colours I received, Pebble and Native Rock I could instantly see how fitting they are with the philosophy behind the range. Real earthy colours that are strong and rich in depth and I instantly fell in love. To the point that I showed everyone the colours, including my beautician friend who I believe has already bought the colours to add to her collection! I was able to have a wonderful manicure with Native Rock (a luscious dusky purple colour) alongside the SpaRitual base and top coats being applied also. I noticed that the nail lacquer spread evenly and gave great coverage with little effort. The lacquer is quite thick yet this is a huge advantage as you really do get great value for money as the colours seem to last longer. In the past I have had to apply many coats to achieve even coverage but two coats of the SpaRituals colour was all that was required. As you can see from the image the colour is identical to what can be seen in the bottle. I was so impressed with my manicure that I couldn’t wait to show it off! Now I am used to having a 3 week non chip manicure so I knew my busy schedule would test the colour to the limit… just how long would it last without chipping? I was actually pleasantly surprised when it did not chip for 5 whole days! Considering in that time I had been clearing out my rental property and cleaning vigorously I think SpaRitual really coped well. I do put this down to the fact that a base and top coat were also applied and I would recommend this wholly when using any nail colour. Once chipped I did remove the colour and attempt to apply Pebble (an earthy grey colour) to my own nails. Never a good idea, the colour, yet again is absolutely amazing though as I am slightly heavy handed and completely unco-ordinated with my left hand my manicure did not look professional! Again the colour lasted a good couple of days before I eventually chipped a nail. At least this time I managed to experience how easy the lacquer was to apply and found it to be silky and smooth with the brush gliding effortlessly. With an RRP of £8.50 for the colours in the Evolve range I find this very reasonable for the high quality that is evident straightaway. As soon as you hold the bulb shaped glass bottle, the range screams luxury. The thick lid/handle is ergonmically shaped and feels very comfortable when in use, the bottles certainly do not look out of place on show. When I researched SpaRitual I was amazed to find out that their nail lacquers are vegan and free of DBP, Toluene and Formaldehyde and Formaldehyde Resin. I had never even considered what effect a vegan nail lacquer could possibly have on my nails but I do believe I now know! 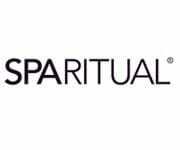 “SpaRitual is committed to creating eco-friendly products and packaging perfectly crafted for the enlightened consumer” and for this I do believe I am now a convert… well everyone does deserve to be pampered every so often and if you cannot afford the time to go to a spa then surely this is the next best thing! * I received the SpaRitual nail lacquers from the Summer 2011 Evolve collection for the purpose of this review – the honest opinions and images are my own.